Phonology is the study of the rule system that governs how particular speech sounds are used to produce meaningful words. It investigates the systematic organization of sounds in a particular language. It describes the basic units of speech in any language and examines how speech sounds change when they are combined. In particular, it is concerned with phonemes – the simplest speech sounds that are capable of creating distinctions in meaning between words. Typically developing children below the age of about 5;00 years may not have developed sufficiently to fully co‑ordinate the movement of their vocal apparatus to realize speech sounds, and combinations of speech sounds, consistently as the mature adult form. Consequently, certain sounds, sound combinations, or transitions from one sound to another, may be too difficult for the child to perform at a particular age. For example, we know that, purely on aerodynamic and anatomical grounds, it is more difficult to produce a voiced plosive consonant than a voiceless one. Similarly, it is more difficult to produce a voiced velar plosive than a voiced alveolar plosive, with the voiced bilabial plosive being easiest of all (Dziubalska-Kolaczyk, 2007). A developing child may, therefore, use another sound that is in some way simpler to produce, or restructure the word so that certain transitions are easier. These reformulations are not activated randomly, however. There appears to be a set of subconscious rules that children use to formulate words. These rules influence which (currently) simpler sounds or sound combinations to use. According to Dziubalska-Kolaczyk, these so-called phonological simplifying processes are natural responses of the human vocal system to the difficulties encountered in the production of speech. Several processes have been identified, each one operating at a single sound or syllabic level in words. The particular world language at the heart of this book is English. There are, of course, many varieties of English: American English, Australian English, Caribbean English, Nigerian English, and so on. In order to standardize our approach, and make valid comparisons between speech sounds, we will be mostly referring to Standard British English with a few examples from General American. If you speak a different variety of English to this, you will still find this series of articles extremely valuable because the principles governing the phonological processes described here are applicable to a wide variety of spoken English. On occasion, when it makes understanding clearer, we may provide an example from American English. Ages are cited in years and months, separated by a semi-colon. For example, for a person aged two years and five months this would be written as 2;05 years. For a person aged three years and eleven months it would be cited as 3;11 years. The phonological simplifying processes described are predominantly operative during the important period of phonological development from about 1;06-4;06 years. However, a few processes may continue a little beyond the upper age limit. The phonological processes described here are common in child language but not in the adult form of the language. Whenever reliable data is available, we will provide an indication of the age at which a typically developing child would cease to use a process that is not a general feature of the adult language. We will draw on the reader’s intuitive grasp of the adult model to claim that certain speech sounds, sound combinations or words are articulated ‘correctly’ (or, conversely, ‘incorrectly’). By this we mean that they are articulated as one would expect them to be articulated in the adult, standard form of the language. We use example words throughout to demonstrate particular processes. As our focus is on phonology – and not language development per se – we are making no claim that any particular example word is representative of a child’s vocabulary at any particular age. The examples are chosen because they can usefully illustrate some particular argument – not necessarily because they are age-appropriate. For example, the word bathe is used to exemplify a phonological process known as labialization, in which bathe /beɪð/ is realized as /beɪv/. Now, we are not claiming that bathe occurs with any particular frequency as part of a young child’s active vocabulary. It is used only to demonstrate the operation of the phonological process. As there are few English words with /ð/ in syllable-final position (lathe, bathe, scathe, sunbathe and swathe are others), the available options for illustrating labialization of syllable-final /ð/ are extremely limited. 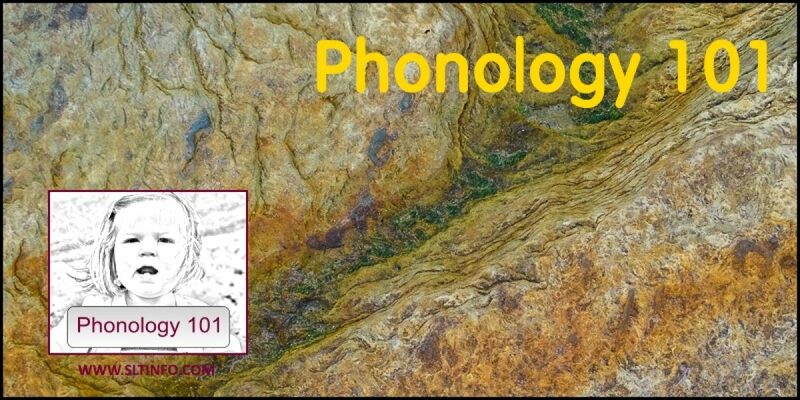 PHONOLOGY 101 assumes an introductory level understanding of the following. Phonetics is the study of speech sounds. It investigates the physical properties of speech sounds, how they are produced by the vocal tract, and how people perceive these sounds. The field is typically divided into three areas: acoustic phonetics, auditory phonetics, and articulatory phonetics. Speech therapists are particularly concerned with articulatory phonetics. The study of how the vocal tract is used to produce (articulate) speech sounds is known as articulatory phonetics. It studies how speech sounds are combined in words and in connected speech. In addition, it investigates how speech sounds vary their place of articulation in the vocal tract, their manner of articulation, the voicing, and so on. It examines the two main categories of human speech sounds: vowels and consonants. IPA is a widely-used notational system for transcribing speech in order to create a written record that can be re-read and analyzed. With this system, there is an unambiguous one-to-one relationship between a speech sound and the written symbol used to represent that sound. For example, bass (meaning ‘a low-pitched sound or tone’) is transcribed as /beɪs/, whereas bass (meaning ‘a type of fish’) is transcribed as /bæs/. IPA symbols are used extensively in PHONOLOGY 101 and the reader should, therefore, have some insight into how each of the English consonants and vowels are transcribed [see International Phonetic Alphabet]. Dziubalska-Kolaczyk, K. (2007). Natural phonology: Universal principles for the study of language (insiders meet outsiders). 16th International Congress of Phonetic Sciences (pp. 71-75). Saarbrücken: ICPhS.